Snippets of Jack: "Do You Think I Wear This Wig To Keeep My Head Warm?" "Do You Think I Wear This Wig To Keeep My Head Warm?" 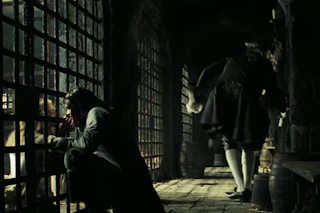 We first meet Lord Cutler Beckett at the beginning of Pirates of the Caribbean: Dead Mans Chest. He shows up with his army of red coats to find Will Turner and they do. Elizabeth: "Will. Why is this happening?" Will: "I don't know. You look beautiful." I'm not sure this is the right time for that. Elizabeth: "It's bad luck for the groom to see the bride before the wedding." You know, when you're getting arrested it is definately not your lucky day. Governor Swann pushes his way through the soldiers to his daughter : "Make way let me through. How dare you. Stand your men down at once. Do you hear me!" Cutler Beckett then turns around slowly. Beckett: "Governor Weatherby Swann. It's been too long." Not long enough, apparently. Governor Swann: "Cutler Beckett?" Beckett: "It's lord now actually." Oh, you're cool. Does this make up for the fact that your four foot two? Governor Swann: "Lord or not you have no reason and no authority to arrest this man." Beckett: "In fact I do. Mr. Mercer?" 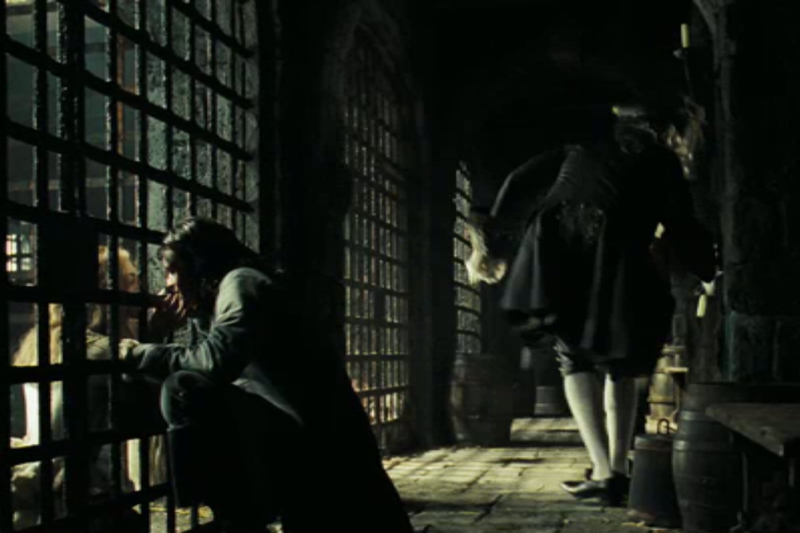 Mr. mercer then hands Beckett the warrants and Beckett continues, "The warrant for the arrest of one Will Turner." Governor Swann looks at the document but what he sees is not what he expects. 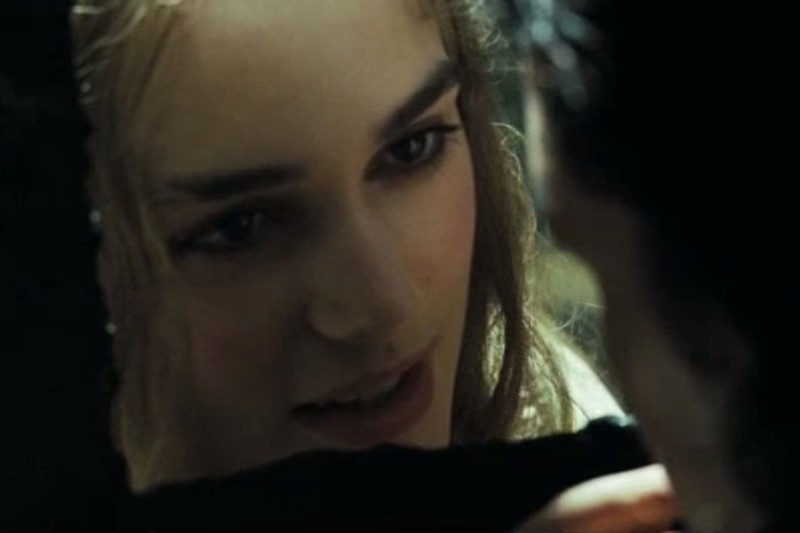 Governor Swann: "This warrant is for Elizabeth Swann." Oh, that's awkward. Beckett: "Oh, is it? That's annoying. My mistake. Arrest her." Bummer. I was hoping they'd shoot her. But wait there's more: "Aha. here's the one for William Turner. And another one for a Mr. James Norrington. Is he present?" Elizabeth: "What are the Charges?" So we just don't care about Norrington's whereabouts anymore? That's nice, Elizabeth. Governor Swann: "Commodore Norrington resigned his commission some months ago." Beckett: "That wasn't the answer to the question I asked." Well then Mr. Bossy Pants. Will Turner: "Lord Beckett, In the category of questions not answered." Um, Beckett asked first, just saying. Elizabeth: "We are under the protection of the jurisdiction of the king's governor of Port Royal and you will tell us what we are charged with." Fancy words. Governor Swann: "The charge is conspiring to set free a man convicted of crimes against the crown and Empire and condemned to death for which the. . ." Beckett: "For which the punishment is regrettably also death." Not good. Poor Will and Elizabeth. Now they are going to be hanged for rescuing Jack Sparrow. How is that illegal? I say it's still worth it all the way. Any way Will finds a way to escape custody and sets out to pursue it. He and the governor rush into the prison where Elizabeth waits for him. Guard: "He can't be here." Governor Swann: "I think you'll find he can." You tell him. Guard: "Mr. Swann!" Governor Swann: "Governor Swann, still. Do you think I wear this wig to keep my head warm?" Respect the wig! Elizabeth has better things to worry about than her father's latest fashion statements. Elizabeth: "Jack's compass? What does Beckett want with that?" Will: "Does it matter?" You'll find that it does. Will: "I'm to find Jack and convince him to return to Port Royal. In exchenge, the charges against us will be dropped." Weatherby objects: "No. We must find our own avenue to secure your freedom." Will: "Is that a lack of faith in Jack or in me?" Take a guess. Governor Swann: "That you would risk your life to save Sparrow's does not mean he would do the same for anyone else. Now, where is that dog with the keys?" Elizabeth: "I have faith in you. Both of you." Well, Jack is a good man and Will is your fiance, so that's always good to know. Elizabeth: "Where will you find him?" Will: "Tortuga. I'll start there and I won't stop searching till I find him and then I intend to return here to marry you." Awwwwww. Elizabeth: "Properly?" Will: "Eagerly, if you'll still have me." Elizabeth: "It it weren't for these bars I'd have you already." This is a really sweet and romantic moment between Elizabeth and Will . . . and Elizabeth's father, who awkwardly drops a candel in the background. He just throws it on the ground. Anyways, back to the romance. Elizabeth: "I'll wait for you." No you won't! You kiss and flirt with Jack. Will: "Keep a weather eye on the horizon." And then he walks away, leaving Elizabeth waiting in her wedding dress.